Tye Tribbett | IGA Talent Mgmt & Consulting Inc. 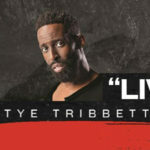 Listen to Tye Tribbett’s NEW Hit Single “LIVE!” Tye has done it again! “LIVE” is climbing the charts and will be featured on Jimmy Fallon February 7th! Mark your calendars! Check out the song below which has already 185,000 streams to date & counting!